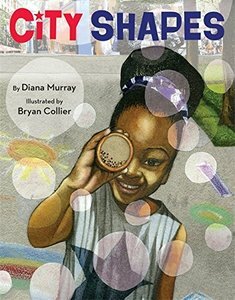 Hunt for shapes of all kinds on this journey through a bustling city, illustrated by four-time Caldecott Honoree Bryan Collier!From shimmering skyscrapers to fluttering kites to twinkling stars high in the sky, everyday scenes become extraordinary as a young girl walks through her neighborhood noticing exciting new shapes at every turn. Far more than a simple concept book, City Shapes is an explosion of life. Diana Murray's richly crafted yet playful verse encourages readers to discover shapes in the most surprising places, and Bryan Collier's dynamic collages add even more layers to each scene in this ode to city living.